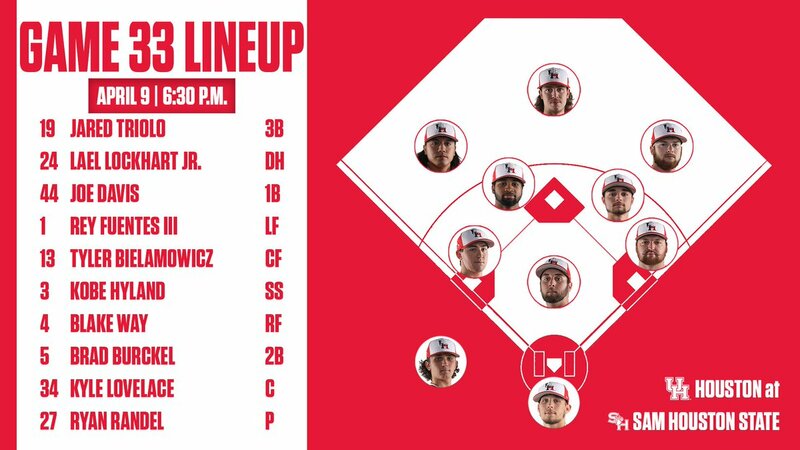 The University of Houston Baseball team steps out of American Athletic Conference play with a visit to Sam Houston State on Tuesday in Huntsville, Texas. • The Bearkats enter the week with a 20-9 record. • SHSU, who is No. 29 in the Collegiate Baseball Top 30, is coming off a series sweep of Lamar in Southland Conference action winning 15-6, 6-5 and 8-4. • Sophomore right fielder Jack Rogers was named the SLC Hitter of the Week on Monday. After recording a walk and an RBI double against Rice on Tuesday, Rogers hit safely in his first three at-bats in the series opener against Lamar, highlighting the game with an inside-the-park home run. In Saturday’s doubleheader, Rogers hit a walk-off home run in the bottom of the ninth of first game and followed with a 2-for-5 effort in the series finale. • Rogers is tied for the SLC lead in doubles (12) and is third in slugging percentage (.613). Senior designated hitter Jordan Cannon (.400) and freshman third base Colton Cowser (.385) ranks second and third in the SLC in batting average. Cannon is also second in on-base percentage (.490), while Cowser is also third in RBI (33). • Bearkats Hunter Hearn (First Team), Clayton Harp (Second Team) and Wesneski (Second Team) were named Preseason All-SLC. All three were named All-Conference in 2018. • The Bearkats, who have won four SLC titles in the last four seasons (2016 regular season and conference tournament, 2017 conference tournament, 2018 regular season), were tabbed to repeat in the SLC Preseason Poll entering the 2019 season. • SHSU is batting .306 as a team and has a 4.73 ERA, compared to opponents’ .277 average and 6.06 ERA. As frustrating as the season has been this year, the next 5 games could help spring the Coogs back into the tourney conversation. @SHSU tonight, @WSU this weekend, and home against the Aggies next Tuesday. 5 Games against Top 65 RPI competition, 4 of them on the road. If Coogs can find a way to go 4-1, they’ll move up. After that, Coogs schedule gets much easier until the end of the season and they can rack up some wins. HBP, single, walk loads the bases and that’s all she wrote for Randel. Hurdsman coming on to pitch. Sac bunt moves both runners up. Groundout to Burckel ends it. I’m not home and was looking at the stats every now and then, put my phone down to talk with someone and we were tied at 2, looked at it again and we scored six runs. I like what happening tonight! Hyland leadoff walk, steals 2nd, Thomas walks, new SHSU pitcher. Burckel bunt, but Hyland forced at 3rd. Thomas caught stealing at 3rd. Wild pitch moves Burckel to 2nd. Lovelace flies out to CF. That’s all for Hurdsman, Roedahl on to pitch. Rooney needs to leave pitchers in long enough to get their groove. Each pitcher has a pitch they excel in but he’s trying to clone them all to pitch the same and it’s not working well… seems like he has about 3 pitchers he will let stay in reguardless of how many times they mess up and others he will pull after a few minor mistakes! It’s as if he’s setting certain pitchers up for failure. I’ve been watching baseball a long time. I’ve never seen coaching like this. I’ve also been a fan of the coogs for a long time. I’d like to see these boys be developed and set up for success like so many past Cougars.